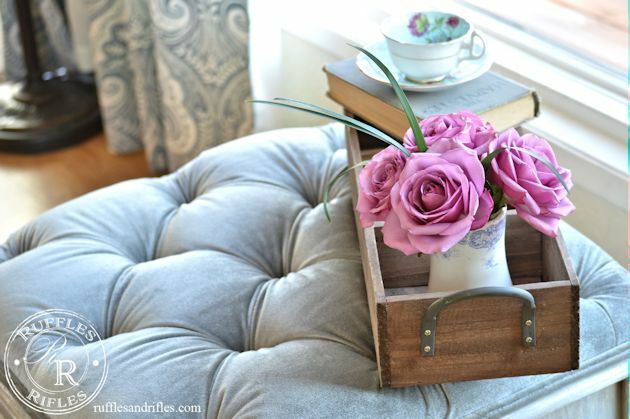 In November I shared about the coffee table I crafted into a velvet tufted ottoman. You can see that post here. In January, it was featured amongst numerous other blogs, and I received countless comments requesting a tutorial. 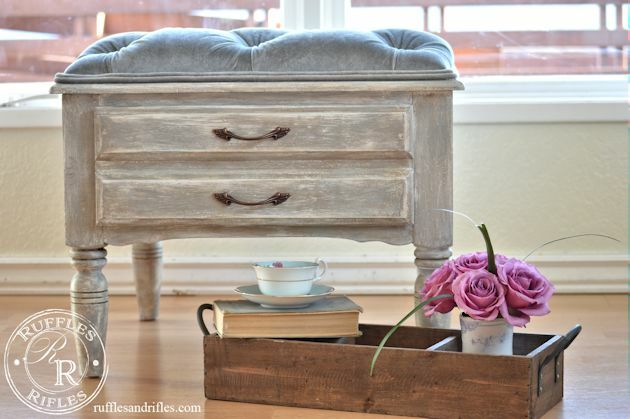 I didn’t take photos as I made the original ottoman, for fear of it not turning out. Well, it more than turned out, and so far has been pinned on Pinterest hundreds of times. 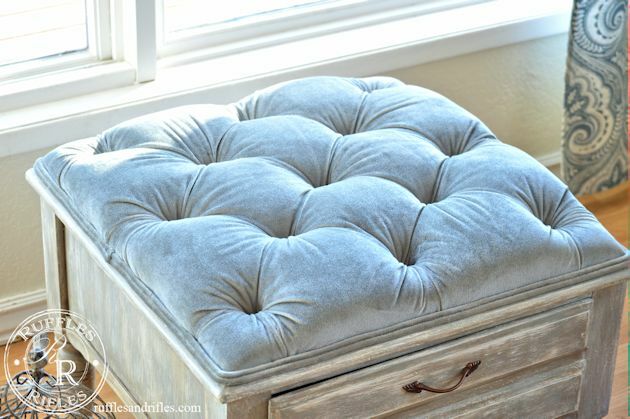 So in an effort to answer these requests, I figured the only thing I could do was make another tufted ottoman for the sole purpose of a tutorial. (Find the tutorial here). 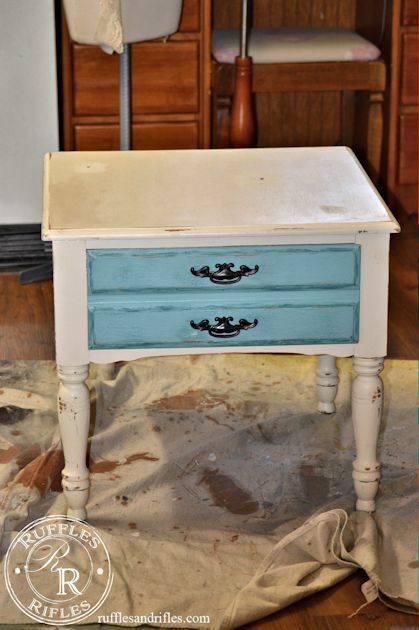 We had a small end table that I painted two years ago (it was actually my first ever furniture paint job) for the baby nursery. I really didn’t have a place for it anymore. 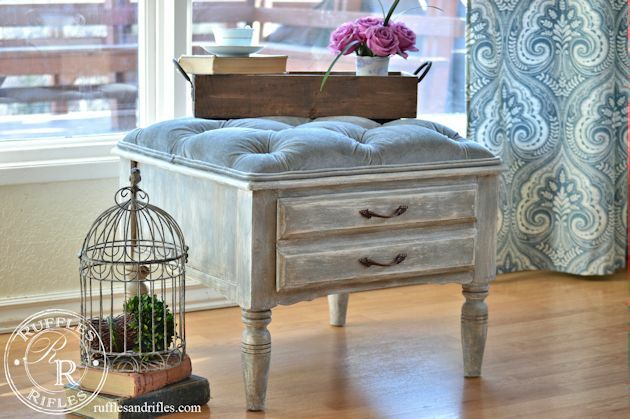 So I decided to convert it into a small tufted ottoman. Since I made this for the sole purpose of a tutorial, I sold it shortly after I put this post up. 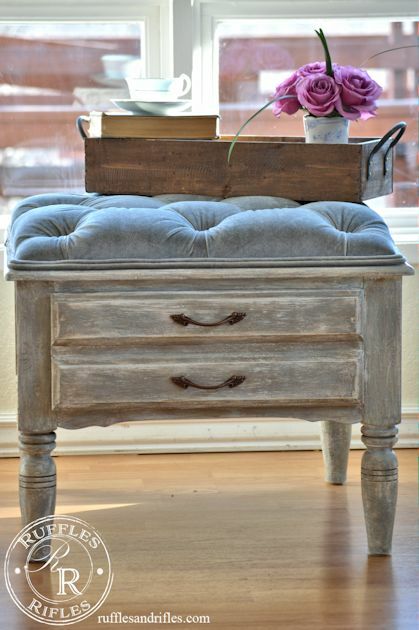 I made this ottoman with velvet again. 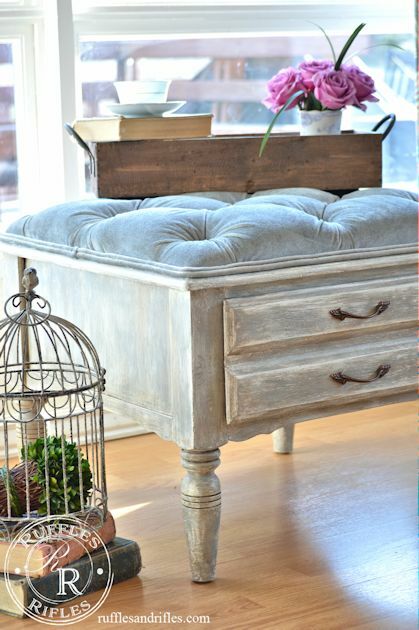 This time I ordered this grey velvet upholstery fabric from fabric.com. It looks a bit blue in the photos, but I assure you, it is grey. 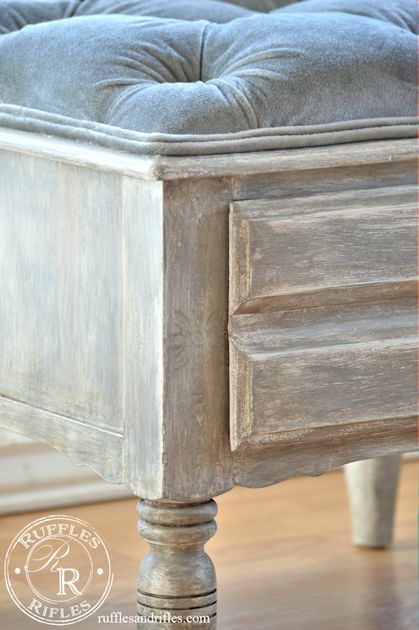 I painted it using three colors, Annie Sloan Chalk Paint in Old White, French Linen and Miss Mustard Seed Shutter Grey. 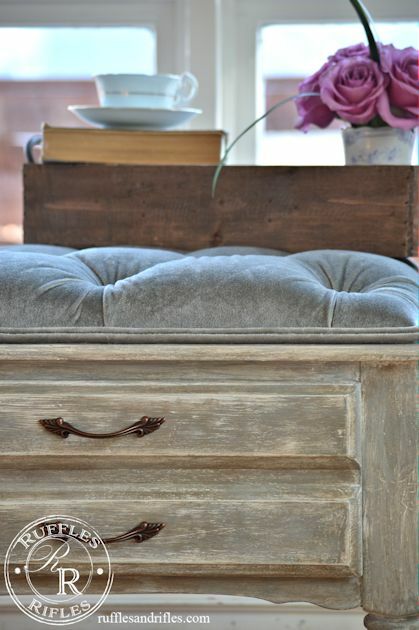 I sealed it up in MMS Furniture Wax and used some Antiquing Wax in the crevasses. 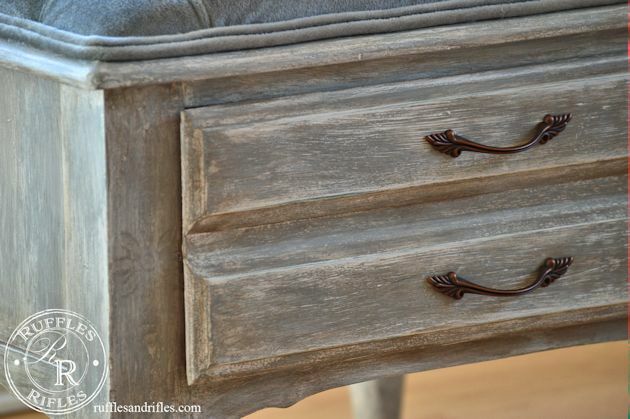 I changed the hardware on the functional drawer to give it a little bit more of a French Country look. The diamond tufting turned out looking like diamonds, always a plus. 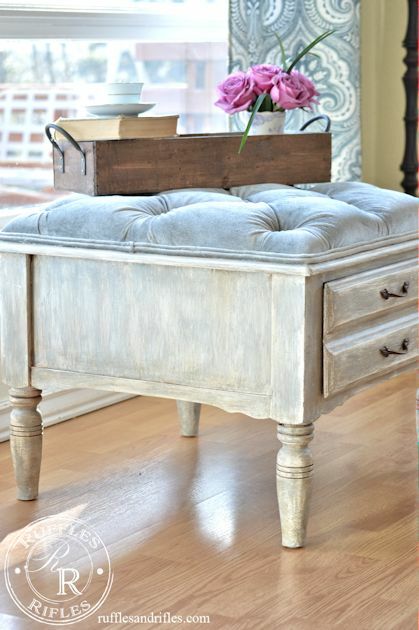 I ran into some different challenges with this ottoman, and I think it actually took as long or longer to make it as the larger one in our living room. Let’s put it this way, I won’t be making tufted ottoman’s for money. They are labor intensive and the necessary materials needed aren’t exactly cheap. But, if you choose to make one, the joy of the creation is so rewarding. Not to mention, you can make it exactly the way you want! Next week I will be posting the tutorial. To give you fair warning, it is going to be the longest post ever and there will be about a million photos.